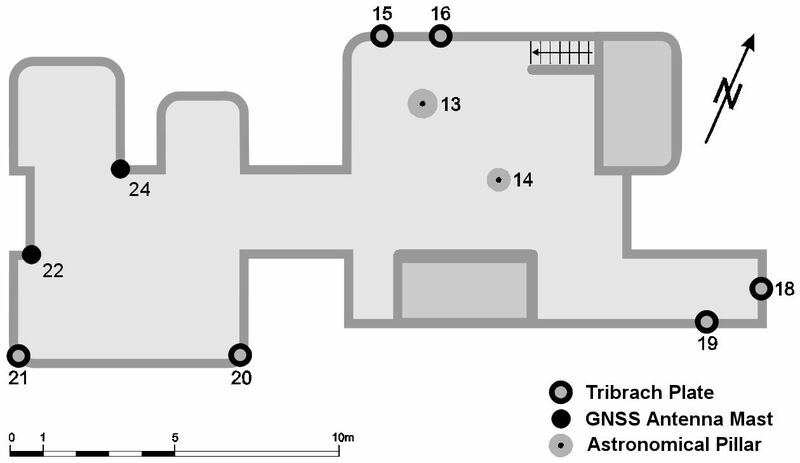 GNSS Laboratory of the Delft University of Technology, Department Geoscience and Remote Sensing, on the former Geodesy building, Thijsseweg 11, 2629 JA Delft, The Netherlands. 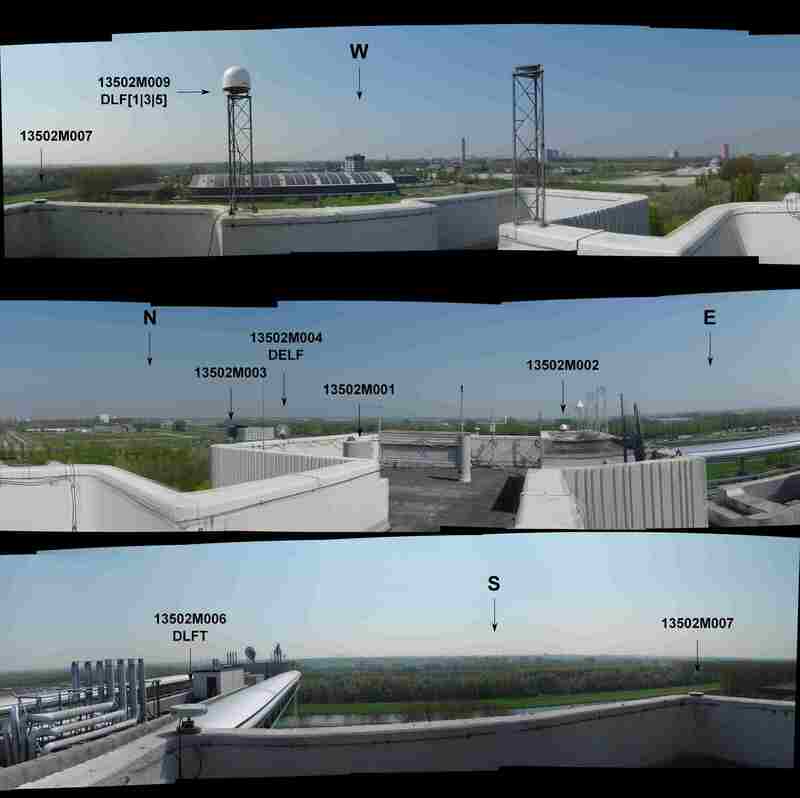 Cell phone antenna were installed on the South tower, 100 meters from the GNSS antennae, transmitting in a 240 degrees sector. 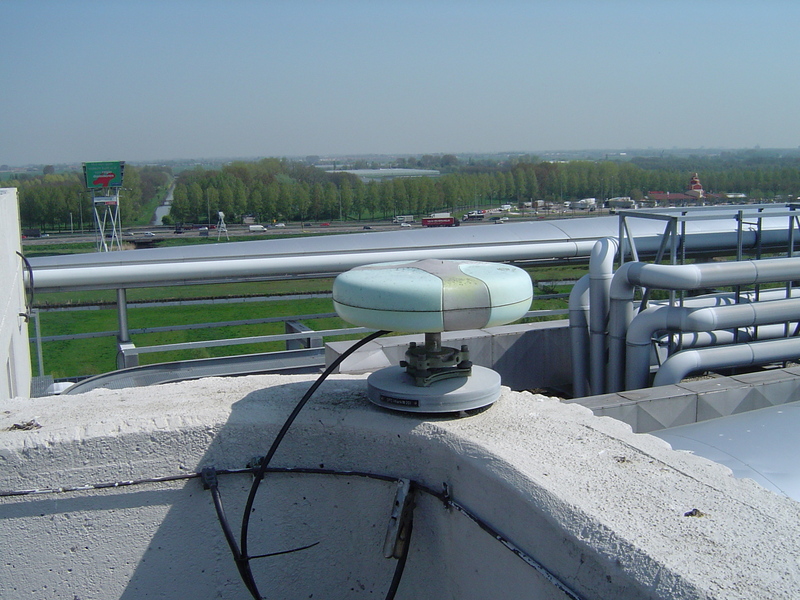 The GNSS antennae are located in a 120 degrees sector not covered by the cell phone (GSM) system. 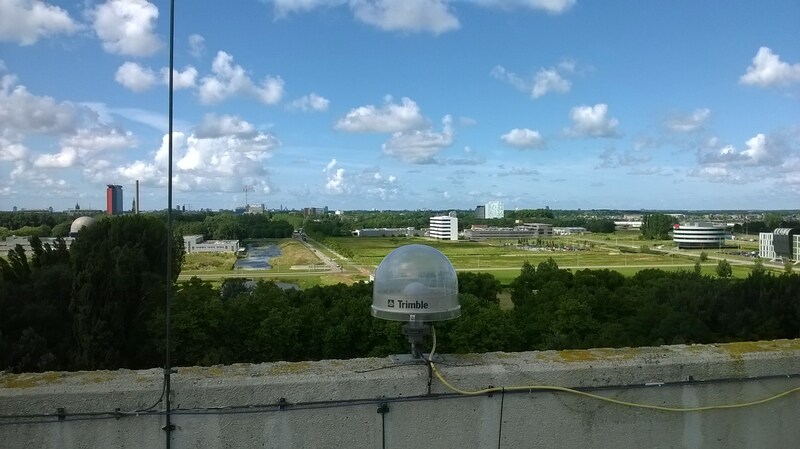 Test with a receiver at 5 meters from the GSM antenna have shown no degradation of the GPS, so it is very unlikely that the GPS observations of the North tower are affected and we have so-far observed no degradation at all. The department of Geodesy moved to Aerospace Eng. The former Geodesy building has been sold to the Dutch Metrology Institute (NMI) who will move into the building January 2005. Until then the building is empty and is undergoing reconstruction. A deal was made with the new owner to continue the GPS observations during and after the reconstruction. Over the next months all technical installations, inventory, cabling, piping and internal walls were removed, resulting in a completely empty and bare building w/o water, heating and electricity. The observatory switched to a temporary power supply and a dedicated Internet connection. Access to the premises restricted working days from 8.00 to 16.00 local time. After Oct 2003 a gradual change southwards of about 1 cm in total on Feb 2004, starting Mar 2004 the movement reversed in the North direction. Over Jan/Feb 2004 a 3-4 mm movement in East-West direction, stable again after Feb 2004. 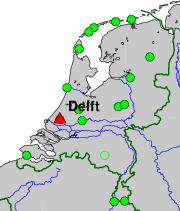 Signs of increased scatter in East-West direction since Apr 2004. The stairs to the observation platform have been removed and a temporary roof was installed over the former stairs (now a vertical shaft). 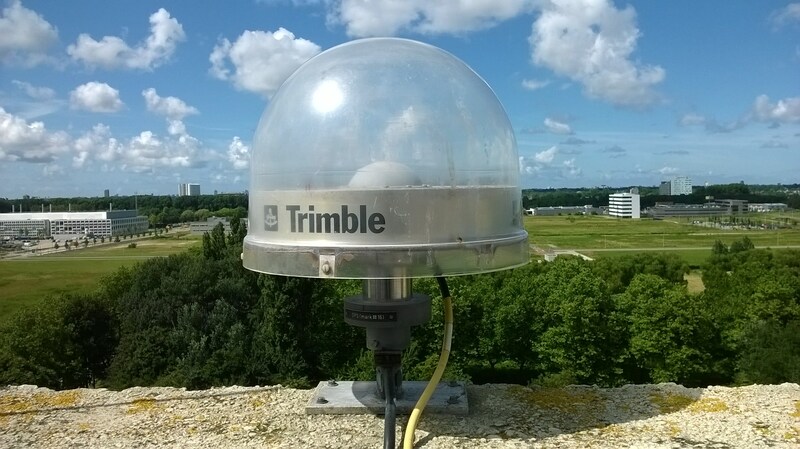 Antenna cable of Trimble 4700 disconnected by vandals resulting in a loss of several hours of data. No other dammage or stolen items from the observatory. Receiver tracking after the event became very poor, which was noticed because we lost the internet connection next day. Receiver tracking became again nominal after the change over from Saterday/Sunday 15/16 May. The Internet glasfibre cable outside the building was hit by a pile and Internet connection was lost. Repairs were effectuated and the Internet connection was restored on May 14th. Power failure. This Saterday morning vandals tried to steal coper cables, and nearly electrocuted themselves. Suspects were arrested several weeks after this event. Power restored again on Monday morning. During a storm the temporary roof installed on April 13 was blown away, partly blocking low elevation signals to the South. Two antenna cables were damaged, but no other damages. The contractor promissed to clean-up and restore the roof a.s.a.p., but actually nothing happened until 5 or 6 July when the former roof was moved a little reducing the effects of the blockage somewhat. A temporary construction lift was attached to the North tower on 2004 Jun 24-30 (date not known exactly), where all the antenna are. The lift is on the North side and connected firmly to the building. 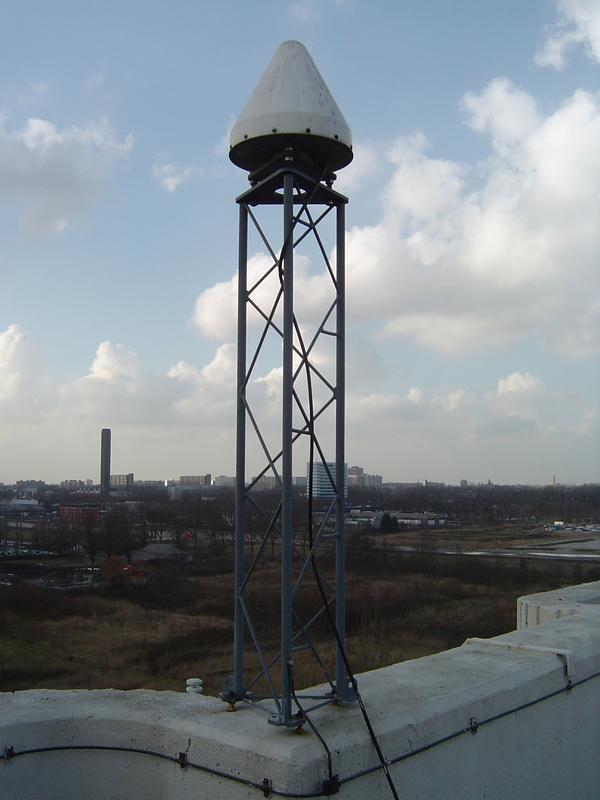 About 75 cm of the metal tower is above the concrete balustrade, about 4 meters to the West from the Trimble 4700 antenna. On June 30 we noticed a change in the amount of data that is tracked. The temporary lift was removed somewhere in the beginning of December 2004 (date not known exactly). Marker 13502M009 had to be temporarily removed and was reinstalled later at more or less the same position. This resulted in a move of 32.7 mm to the South, 1.4 mm to the East and 6.3 mm Down. The shift is: dX=0.0217, dY=0.0031, dZ=-0.0251 in ECEF, or dN=-0.0327, dE=0.0014, dU= -0.0063 in a local frame. The old marker has been renamed to 13502M009X. At the same time the Ahstech Chokering antenna was replaced by a LEICA AR25.R3 chokering. The antenna cable run consists of a 30 m LMR400 outdoors, a Huber-Suhner type 3402.17.A surge protector, 10 m LMR400 indoors, GPS Networking Inc. 4-way high-isolation antenna splitter N HI AL DCB S1X4-N/ 12/ 220, with 17 dB gain and 12 V DC feed to the antenna, and short 3 m cables to the each receiver. 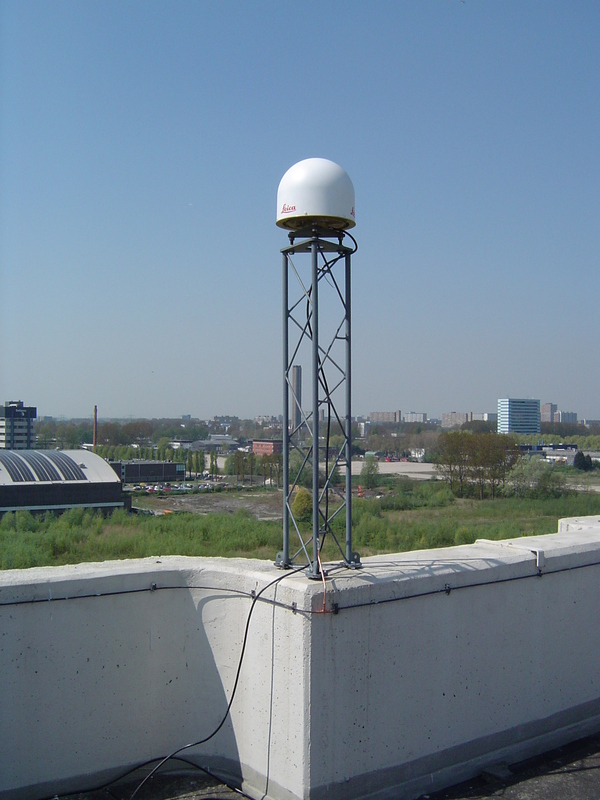 The antenne for the Eurocontrol Data Collection Network (EDCN) has been moved from marker 13502M007 to marker 13502M009. The antenna splitter connecting the LEIAR25.R3 LEIT (marker 13502M009) to DLF1, DLF2, DLF3 and DLF5 has been replaced on November 1, 2013, between 13:50-13:10 UTC. The new splitter is a Networked High Isolated Amplified DC Blocked 1x8 splitter from GPS Networking (NHIALDCBS1X8-T/12/220, S/N 76256). It replaces a 1x4 splitter from the same brand (NHIALDCBS1X4-N/12/220, S/N 53494). The antenna cable run now consists of a 30 m LMR400 outdoors, a Huber-Suhner type 3402.17.A surge protector, 10 m LMR400 indoors, GPS Networking Inc. 8-way high-isolation antenna splitter N HI AL DCB S1X8-T/ 12/ 220, with 14 dB gain and 12 V DC feed to the antenna, and 3 m flexible RG223 type cables from the splitter to the each receiver. The antenna cable of the LEIAR25.R3 LEIT antenna on marker 13502M009 has been replaced (DLF1, DLF2, DLF3 and DLF5). In order to change the antenna cable the antenna had to be unbolted from the monument; after the cable replacement the same antenna was reattached to the monument in exactly the same position. The bronze alloy retaining bolt has been replaced by a stainless steel bolt. The new antenna cable is of the same type LMR400 and length. The antenna was in good working order and was cleaned. The antenna was operational again on Aug 4 2015, 11:39:28 UTC. No data is available from Aug 3 2015, 18:15:21 until Aug 4 2015, 11:39:28 UTC. The receiver/antenna developed a problem and no data has been recorded since 2012-02-15. The station DLF1 was discommissioned on 2012-04-16. The antenna will be removed for calibration. Users are adviced to use instead the IGS MGEX station DLF1 on the nearby marker 13502M009. DLFT will be decommissioned in near future and replaced by DLF1 on marker 13502M009. Data for DLFT will be available in parallel to DLF1 for a limited period. Please use DLF1 instead of DLFT. DLF1 provides a multiple system (GPS/GLONASS/GALILEO) and frequency (L1/L2/L5) receiver at a lower multipath location. Replaced antenna cable (Belden RG8) by LMR-400. The antenna cable of the LEIAR25.R3 LEIT antenna (DLF1) has been replaced. In order to change the antenna cable the antenna had to be detached from the monument; after the cable replacement the same antenna was reattached to the monument in exactly the same position. The bronze alloy retaining bolt has been replaced by a stainless steel bolt. The new antenna cable is of the same type LMR400 and length. The antenna was in good working order and was cleaned. The antenna was operational again on Aug 4 2015, 11:39:28 UTC. No data is available from Aug 3 2015, 18:15:21 until Aug 4 2015, 11:39:28 UTC. DLF1 has been added to the IGS and EPN networks. See IGS mail IGSSTATION-6225. At the same time DLF1 has been added to the EPN network and routine uploads of RINEX 2 data to BKGI and OLG were started. RINEX 3 data continues to be available from the IGS-MGEX data stores. In addition to daily, hourly and high-rate RINEX 3 for all systems, daily RINEX 2 with 30 sec GPS and GLONASS data are available since the start op operation in April 2011. 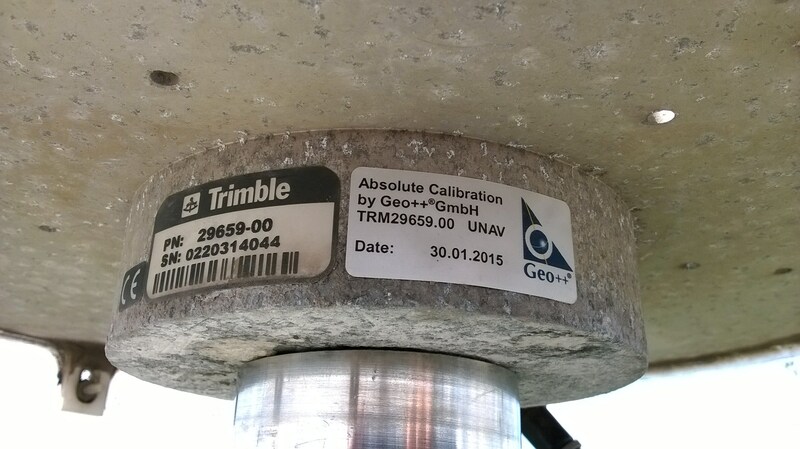 Since 1 March 2015 also hourly RINEX 2 files, with 10 second GPS and GLONASS, are kept. No data has been logged on account of a disk-full condition. DLF1 started streaming NTRIP data to Trimble VRS-NOW. All data for this period has been lost. Receiver was connected to the external CESIUM clock of the NMI. The 10 MHz from the external CESIUM was enabled in the receiver settings from the start. However, clock steering has not been disabled during this period, except fro some brief experimentation, and is currenty on. During some short periods in 2011 clock steering was disabled. So the receiver is running on the external frequency, but the clock is still adjusted using satellite signals. Clock steering will be disabled on a later to be announced moment in 2015. 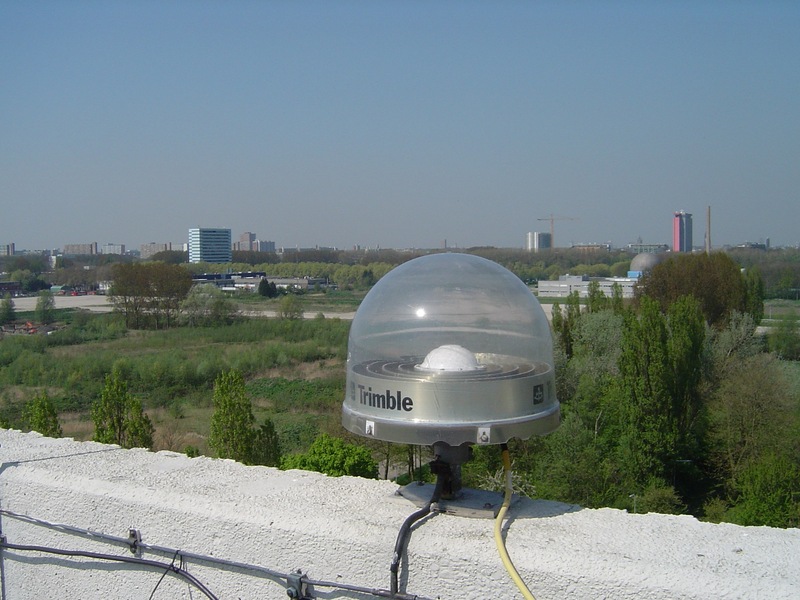 All systems (GPS+GLO+GAL+BEI+QZSS+SBAS) are tracked and data is archived in daily 30 sec interval, hourly 10 sec interval and 15 minute high-rate 1 Hz multi GNSS RINEX version 3 files, as well as the raw data in T02 format. The GPS and GLONASS data is kept also as daily 30 second RINEX version 2 files for legacy purposes. Starting 1 March 2015 also hourly RINEX 2 files with 10 second GPS and GLONASS are saved. DLF1 is part of the IGS M-GEX network. DLF1 is also intended as a replacement for IGS station DLFT. The antenna cable of the LEIAR25.R3 LEIT antenna (DLF2) has been replaced. In order to change the antenna cable the antenna had to be detached from the monument; after the cable replacement the same antenna was reattached to the monument in exactly the same position. The bronze alloy retaining bolt has been replaced by a stainless steel bolt. The new antenna cable is of the same type LMR400 and length. The antenna was in good working order and was cleaned. The antenna was operational again on Aug 4 2015, 11:39:28 UTC. No data is available from Aug 3 2015, 18:15:21 until Aug 4 2015, 11:39:28 UTC. This receiver is streaming data directly to JAXA. No raw data or RINEX files are stored at the local data center. For the RINEX data, please contact JAXA directly. The antenna cable of the LEIAR25.R3 LEIT antenna (DLF3) has been replaced. In order to change the antenna cable the antenna had to be detached from the monument; after the cable replacement the same antenna was reattached to the monument in exactly the same position. The bronze alloy retaining bolt has been replaced by a stainless steel bolt. The new antenna cable is of the same type LMR400 and length. The antenna was in good working order and was cleaned. The antenna was operational again on Aug 4 2015, 11:39:28 UTC. No data is available from Aug 3 2015, 18:15:21 until Aug 4 2015, 11:39:28 UTC. A new receiver and data logger were installed this morning around 8.30 UTC. The old receiver was removed at 8.25 UTC. The data logging with the new receiver started around 8.40. From the outside everything seems to work ok. 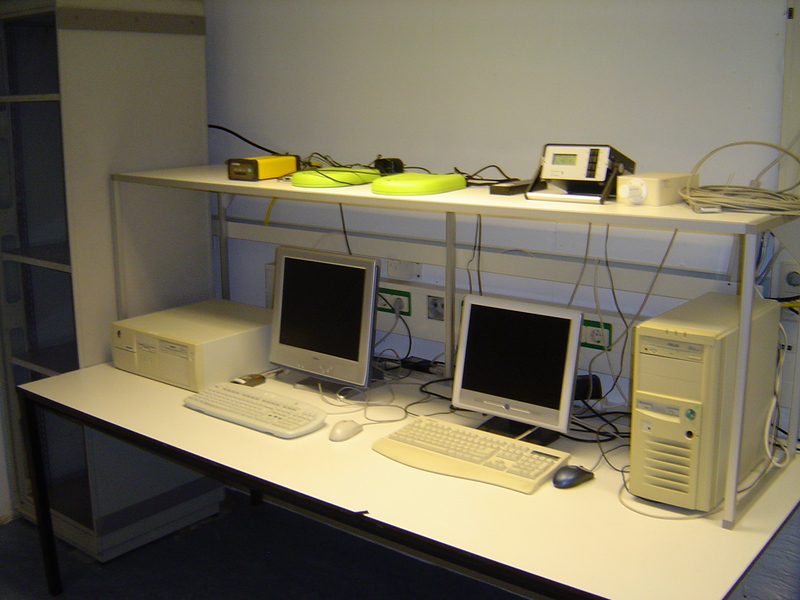 The receiver is tracking (flashing light indicating that satellites are tracked) and the data logger has the same IP as the old PC. 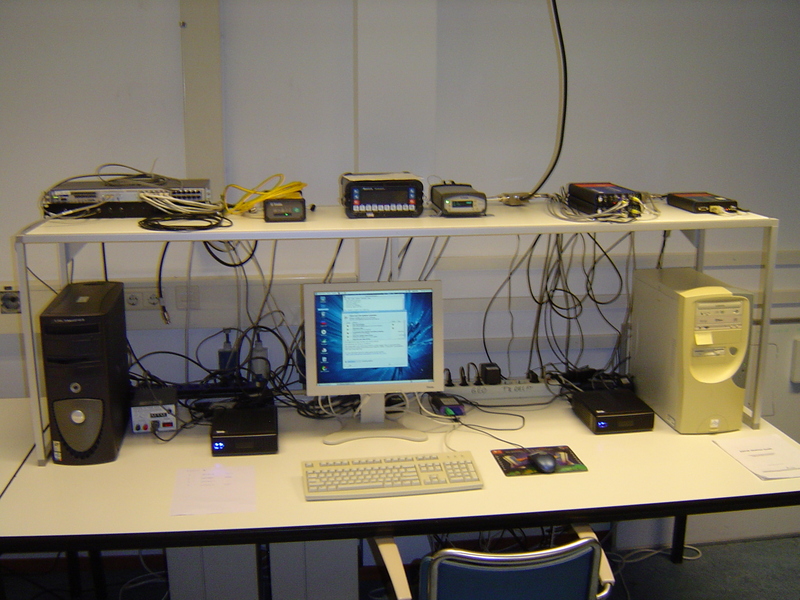 The receiver was initially connected to COM1, but on Nov 17, 2011,9:50 utc, the ethernet port of the javad receiver was connected to ubs port 1 on the datalogger using an usb-ethernet adapter. The software on the datalogger is GDGPS 3.3.3. The receiver is a Javad Delta G3T (TRE_G3TH) with S/N 00849. 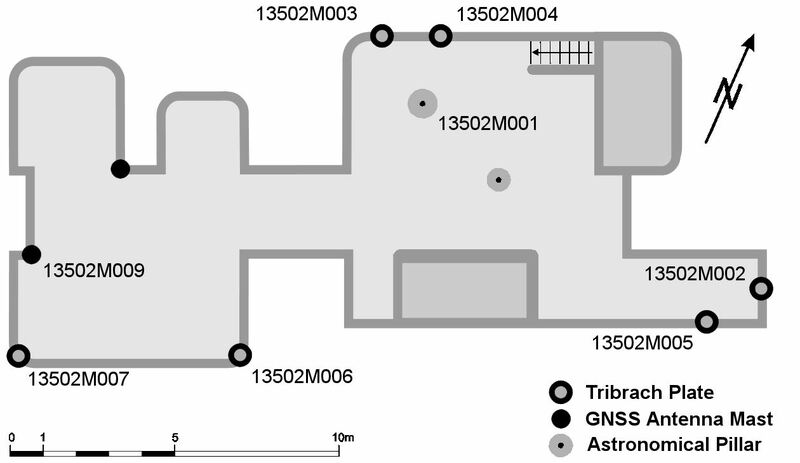 The data logger has S/N 5029682 (JPL GPS BASESTATION). The antenna setup has not been changed; same marker and same antenna as before (LEIAR25.R3 LEIT). The receiver is not (yet) connected to the external frequency standard (we have a 10 MHz signal from the timing lab). Marker 13502M009 had to be temporarily removed and was reinstalled later at more or less the same position. This resulted in a move of 32.7 mm to the South, 1.4 mm to the East and 6.3 mm Down. The shift is: dX=0.0217, dY=0.0031, dZ=-0.0251 in ECEF, or dN=-0.0327, dE=0.0014, dU= -0.0063 in a local frame. The old marker has been renamed to 13502M009X. At the same time the Ahstech Chokering antenna was replaced by a LEICA AR25.R3 chokering. This receiver is streaming data directly to JPL. No raw data or RINEX files are stored at the local data center. For the RINEX data, please contact JPL directly. The receiver was stopped on 5 December 2010. Data from the same antenna continues to be available from DLF5. The antenna cable of the LEIAR25.R3 LEIT antenna (DLF5) has been replaced. In order to change the antenna cable the antenna had to be detached from the monument; after the cable replacement the same antenna was reattached to the monument in exactly the same position. The bronze alloy retaining bolt has been replaced by a stainless steel bolt. The new antenna cable is of the same type LMR400 and length. The antenna was in good working order and was cleaned. The antenna was operational again on Aug 4 2015, 11:39:28 UTC. No data is available from Aug 3 2015, 18:15:21 until Aug 4 2015, 11:39:28 UTC. This is a temporary occupation. 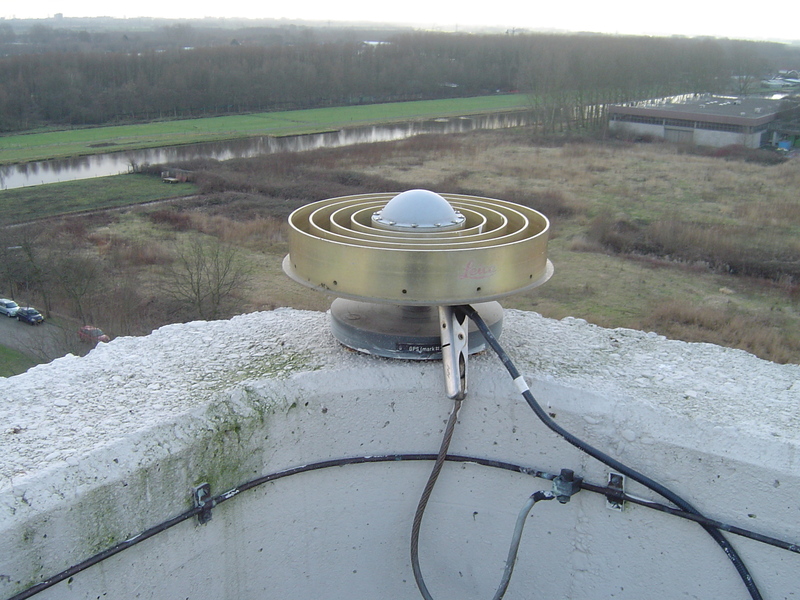 On April 15 2011 the receiver and antenna have been relocated to stream DLF1 and marker 13502M009. For more information contact Hans van der Marel.